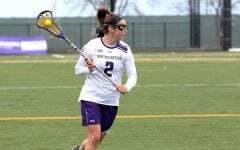 Defense proved to be Northwestern’s Achilles heel on Friday night, as USC outmatched the Wildcats 14-11 to put the team below .500 on the season. The No. 6 Trojans’ (14-0, 7-0 Mountain Pacific) No. 1 scoring offense in the country proved too much to handle for No. 12 NU (6-7,1-1 Big Ten), which could not keep pace with USC’s high-powered counter attacks. The Cats started the game strong, jumping out to an early 3-1 lead. But NU’s lack of success at the draw circle and slow defensive rotations proved problematic, allowing the Trojans to score 4 consecutive goals to close the half. Outside of sophomore attacker Selena Lasota scoring 2 goals in the first half, the Cats’ offense struggled early. NU doubled USC’s shot total in the period, but the Trojans were able to draw double teams and find open players on the crease to increase their shot accuracy. The Cats’ defense had difficulty rotating with USC’s fast-paced ball movement, leaving freshman goalkeeper Mallory Weisse to deal with a plethora of one-on-one shots. The Trojans took advantage of their opponent’s slow defensive slides and scored 2 goals with less than 2 minutes remaining in the first half to give USC a 5-3 lead going into halftime. But the Cats came out of the break with a sense of urgency. 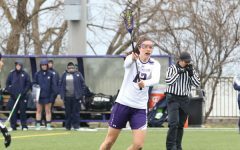 Sophomore Shelby Fredericks won the first six draw controls to set the pace for the second half, and NU matched its opponent’s high-tempo offense by launching frequent counter attacks. The Cats also received scoring assistance from senior midfielder Nancy Dunbar and freshman attacker Leighton Yenor, who helped cut the lead to 8-7. However, NU’s defense continued to have problems stopping USC in transition, despite the team’s heightened riding efforts and applied pressure on its opponent’s defense. The Cats tried to pressure the Trojans as they cleared the ball to force turnovers, but USC took advantage of the pressure and continued its dominant counter attacking. USC midfielder Amanda Johansen scored 3 straight goals for the Trojans to give them a 12-7 lead with just over 10 minutes remaining in the game, and the Cats couldn’t answer back. USC continued to feed the crease, recording 11 assists on the team’s 14 goals. NU found success though by giving the ball to senior midfielder Spring Sanders late in the game. Sanders used her immense pace to run through the Trojans’ defense, and scored her first 2 goals of the season late in the game. Despite the late surge from Sanders, USC maintained control in the dwindling moments of the game and kept its undefeated season alive. The Cats next take on Rutgers on Sunday, in the team’s third conference game of the season.